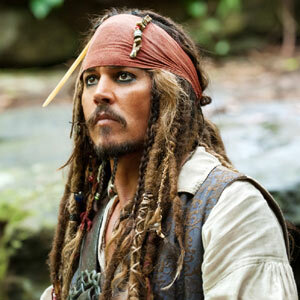 Johnny Depp is the unscrupulous but freedom-loving Jack Sparrow in Pirates of the Caribbean: On Stranger Tides. MANILA, May 23 -- Capt. Jack Sparrow found the elusive Fountain of Youth at the Philippine box-office, as Disney’s Pirates of the Caribbean: On Stranger Tides opened at No. 1 with a nationwide gross of a swashbuckling P62.37 million for the Friday to Sunday (May 20 to 22) period. That opening figure is 2011’s highest to date, overtaking Thor’s P59.5 million several weeks back. "This was announced today by Victor R. Cabrera, managing director of Walt Disney Studios Motion Pictures International which locally distributed the film. "The film’s three-day haul also managed to become the third biggest opening weekend ever for a Disney title, close on the heels of 2007’s Pirates of the Caribbean: At World’s End (P71.3-million) and 2006’s Pirates of the Caribbean: Dead Man’s Chest (P65.5-million) which both had the advantage of five-day opening weekends. "Along the way, On Stranger Tides also triumphantly broke the following Disney records: Biggest opening day ever at P18.8-million, beating 2005’s The Chronicles of Narnia: The Lion, the Witch and the Wardrobe at P18.6-million; biggest Friday (P18.8- million), Saturday (P21.4-million) and Sunday (P22-million) receipts ever, surpassing the grosses of 2010’s Toy Story 3 on the same days. "SM Mall of Asia (P5.01-M) posted the highest sales over all cinemas, followed by SM North EDSA (P3.35-M), Trinoma (P3.23-M), SM Cebu (P2.56-M), SM Megamall (P2.48-M), Power Plant (P2.20-M), Glorietta 4 (P2.14-M), Greenbelt 3 (P2.11-M), Eastwood (P1.78-M) and Alabang Town Center (P1.65-M). "Also reporting robust figures are Newport Cinema (P1.58-M), Gateway (P1.39-M), Shangri-la (P1.34-M), Ayala Cebu (P1.27-M), Greenhiils (P1.10-M), Robinsons Ermita (P1.05-M), SM Baguio (P1.03-M), Robinsons Galleria (P1.02-M), Festival (P1.01-M) and Market Market (P 994,626). "Starring Johnny Depp in his iconic role of Captain Jack Sparrow, Pirates of the Caribbean: On Stranger Tides captures the fun, adventure and humor that ignited the hit franchise—this time in Disney Digital 3DTM. Crossing paths with the enigmatic Angelica (Penélope Cruz), Jack Sparrow is not sure if it’s love—or if she’s a ruthless con artist who’s using him to find the fabled Fountain of Youth. When she forces him aboard the "Queen Anne’s Revenge," the ship of the legendary pirate Blackbeard (Ian McShane), Jack finds himself on an unexpected adventure in which he doesn’t know whom to fear more: Blackbeard or Angelica, with whom he shares a mysterious past. "Still playing across the Philippines in IMAX 3D, Disney Digital 3D and regular format, Pirates of the Caribbean: On Stranger Tides is distributed by Walt Disney Studios Motion Pictures International through Columbia Pictures."